I made a couple changes to the RouterJockey store this week and I wanted to make sure I got the word out. Previously the store worked in sprints that I tried to open up 2-3x a year. Instead of trying to manage these sprints, and keep the products updated, I’ve now made the store available year round. It still operates in sprints, but instead of being 2-3 weeks long, they’re only 3-4 days each. On top of being more available, the store now has a few new products, nothing too exciting, but we do have a RJ phone case, a PCAP mug, and a couple stickers for sale. Teespring has recently added these products and as I get requests for other products I will be sure to add them. As usual, if you have any questions, hit me up on twitter or use the contact form. Click here, or use the store item in the menu bar to visit my new storefront. 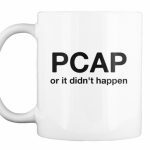 PCAP or it didn't happen.... The t-shirt!